Double Fine has a way of breathing new life into old genres. They weave weird, wonderful stories through familiar mechanics to create experiences unlike anything else. Psychonauts twisted the 3D platformer by having you quite literally exploring people’s psyches. Costume Quest drew a story of childhood adventure around a Japanese-style RPG where Halloween costumes served as character classes. Brutal Legend fused the age-old brawler with a Tenacious D-like celebration of the metal. Headlander is the latest example of this Double Fine approach. On paper, it’s a typical Metroidvania – which is no bad thing – but it finds its own groove with a wacky, ‘70s B-movie sci-fi story. The end result is strangely delightful and delightfully strange. In Headlander’s vision of the future, the human body is a thing of the past. People live on by uploading their consciousnesses to cloud storage, with replaceable robot bodies there to serve any need for a physical existence. These robot people live in the Pleasure Dome, a sort of totalitarian paradise; in exchange for their freedom, they get to live carefree, ignorant lives of leisure. Of course, things are more sinister than they first appear, and the ruling AI isn’t quite as benevolent as it first appears. As the last human – you’re only a preserved head, but that’s more human than anyone else – it’s up to you to figure out the truth and stop Methuselah’s evil schemes. It’s a simple plot, but it captures the odd appeal of ‘60s and ‘70s science fiction beautifully. It also lends Headlander one of its most charming qualities: its kitschy sense of retrofuturistic style. The whole game echoes the likes of Logan’s Run, Lost in Space, and Barbarella, with its pastel colour schemes, odd robots, and abundance of cheeky innuendo. Psychadelic sensibilities pervade the look and feel of every room and hallway in Methuselah’s kingdom. It’s the sort of oddball design that makes the Pleasure Dome a joy to explore. 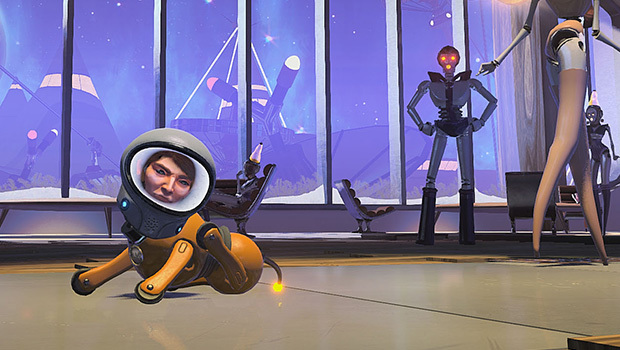 This premise also feeds into Headlander’s core hook: you play as a flying head that can “headland” into robot bodies and other machinery to take control. Different bodies have different abilities, which feeds the Metroidvania exploration element. Most doors are locked unless you can get the body of security robot with the right clearance, as indicated by the robot’s colouring. Little cleaning bots and robo-dogs let you squeeze through small service hatches, wheeled robots with rubber tyres can cross electrified flooring unscathed, and so on. It’s an interesting, somewhat unusual approach to ability-based exploration, but it works really well. The security bots are also the cornerstone of Headlander’s combat system. Each is equipped with a laser gun, but the shot patterns vary between individuals. Some are just a single measly shot, fired straight forward; others will shoot two or three beams in parallel, or send them off at different angles. With the right robot, and therefore the right gun, you can throw enough shots around to make a bullet hell shoot ‘em up blush. To make things even more chaotic, these laser shots can ricochet off walls and obstacles. The extent of this depends on the robot’s security level – higher clearance means more bounces. Needless to say, as the game goes along and higher-ranked bots become more common, bullets will be flying all over the show. It’s a sort of controlled chaos, though; if you want to win fights, or even just survive, you need to use the ricochets to your advantage. Taking cover out of direct line of fire and using walls and mirrors to line up head shots is a great way to thin enemy numbers. Just be aware that foes will use this to their advantage as well, so you have to always be on your toes. Of course, you also spend plenty of time flying around as a disembodied head in a rocket-powered container. There are plenty of air vents and the like that you can only travel through in head form. It’s small and nimble, making it great for avoiding enemy gunfire, and a very handy vacuum beam lets you rip enemies’ heads off when you get close – instantly deactivating them and freeing up a body for you to claim. This flying head is also a means of more typical Metroidvania progression. Headlanding into special nodes found throughout the Pleasure Dome lets you expand the head container’s abilities, increasing its versatility and allowing you to reach areas that you couldn’t previously. For example, an air-dash has obvious benefit in combat by letting you quickly close in on foes, but it also lets you boost through crusher traps and, when upgraded further, break through certain walls. A shield can reflect laser beams, both those shot by foes and those that gate sections of the map. There aren’t a lot of such upgrades, but it’s nice to have a bit of that more classic, permanent upgrade progression to balance out the disposability of the robot bodies. With the head’s permanent upgrades and puzzles built around finding the right robots and getting them to where they’re useful, exploring the Pleasure Dome is a joy. The B-grade sci-fi story threaded through all of this is uncanny, in the best possible way, making Headlander a bizarrely engrossing head-trip of a game. Headlander is developed by Double Fine and published by Adult Swim Games. It’s available now for PC, PS4, and Xbox One. An Xbox One press copy was supplied by Adult Swim Games for this review.